You could map out quite the cross-country adventure if you traveled from one top-ranked, super fast roller coaster to another. 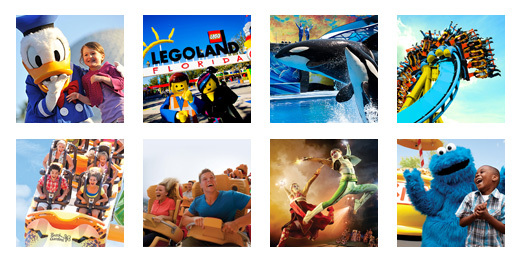 Even better, TicketsatWork.com features special discount tickets to many of the theme parks where these must-try, top ten fastest roller coasters are located. Over at Six Flags Great Adventure in Jackson, New Jersey you will encounter Kingda Ka – the tallest and fastest roller coaster in North America. This upside down U-shaped track bolts up 45 stories in the sky—that’s 456 feet high! This leaves all other coasters in the dust. And of course it’s going to take some mighty acceleration to get you to the top of it. You’ll leave the station going from 0 to 128 miles per hour in a jaw-dropping 3.5 seconds. You’ll be shooting up that impossible height so fast, you won’t even have time to think, so just hang on. It’s 90° straight up. And once you get to the top you’ll be plummeting right back down in a 270-degree spiral. Attention parents in Orlando (or parents who might be passing through Orlando with the kids! ): Halloween is just around the corner. So while you’re thinking about fun costumes for the kiddies, you can also start checking out all the great Halloween activities the entire family can enjoy in Orlando. And TicketsatWork.com is happy to offer ghoulishly good special ticket prices. Let’s take a closer at a quartet of awesome Halloween attractions, particularly nice options for the little kids, who haven’t quite graduated to the super scary Halloween events. Ghouls, ghosts and goblins descend on LEGOLAND Florida Resort transforming it into a haunted adventure. This spooky event takes place select dates in October, and features trick-or-treating along the brick-or-treat trail, super brick building activities, the largest LEGO Jack-O-Lantern in the world, Halloween entertainment and an all-kids costume contest with brick-tastic prizes! It’s going to be a great Halloween for the kids in Orlando. Find plenty of treats at TicketsatWork.com and show the little kids a Halloween celebration they won’t soon forget. As we prepare to mark the 14th anniversary of the events of September 11, 2001, TicketsatWork.com is proud to offer a special discounted ticket package for our members to experience the 9/11 Memorial tour and museum. The 9/11 Memorial & Museum is a truly remarkable setting, honoring those whose lives were forever changed on that day. The tour and museum package is ideal for locals and visitors in New York City who desire to get a better perspective of the events of 9/11.